Since I can remember, I have experienced a huge spectrum of very intense emotions. And many times throughout my life these emotions felt like more than I could bear. They have lead me on many journeys…oftentimes into deep, dark sorrow…sometimes into incredibly joy and ecstasy…and everywhere in between. During my journey here in India, I have experienced many intense emotions, including a lot of deep sadness, and this has brought me back something that I have often wondered about. When I am experiencing this deep sadness, am I purifiying myself by releasing OLD emotions, or am I creating NEW sorrows in these situations? In other words, is the situation being created for me so that I can experience a certain emotion in order to RELASE that emotion from my system, or is the situation creating NEW emotions that I will have to release at a later time? And if it’s true that the old emotions are coming up to be released, does that mean that there is a finite amount of old stored emotions, and are they stored in my body somewhere? And is depression simply extreme sadness, or is there more to it? Do the same rules apply to depression as they do to sadness, or does depression have a more significant physiological aspect to it? Maybe depression really is a disease, and therefore not to be treated the same way as actual emotions? A lot of unknowns here to grapple with. I asked Daniel what he thought about all of this, and he said that he thinks that we are always on a path of continuous purification, and the purification constantly wantsto happen. So when we are upset, we have the choice to either resist it, and thereby create more stress, or to allow the purification to happen. I hope you will enjoy the following passage from “The Journey Home.” And if you love it, you might love reading the rest of the book as well. I read it on my way to India and it’s become one of my favorite books. 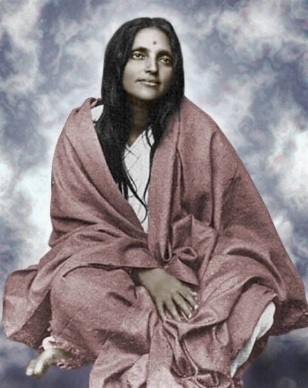 Radhanath Swami was told that Anandamayi Ma, who was the guru of Prime Minister Indira Ghandi, was born in an obscure village in East Bengal at the dusk of the nineteenth century. From childhood she was indifferent to the trappings of the world and at times she bewildered her family by her spiritual trances. As her followers spoke to Radhanath Swami about her ecstasies, miracles, and compassion, Radhanath Swami became more enthralled than ever. Just then, everyone rose to their feet as a petite lady appeared in the assembly wearing a simple white sari. Greeting them with folded palms, her eyes glistened with joy and she sat on a chair. Thin and frail, she nonetheless emanated an unearthly power. Although the lines of time were drawn upon her wrinkled face, it shone like a playful child’s. She appeared wise and sober, like a universal mother, and yet she also radiated the exuberance of an innocent little girl. Although her demeanor was as soft as the flower she held in her hand, one could feel that she possessed an indomitable willpower. Smiling upon them, she led everyone in chanting God’s names, all the while clapping her hands. Then, after several moments of silence, she spoke words of love, wisdom, and selflessness. “Love is everlasting forgiveness,” she began. “Wisdom is to see everything in relation to the whole. If you understand that everything belongs to Him, you will be free of all burdens.” Gracefully touching her hand to her heart, she closed her eyes. “All sorrow comes from the sense of I and Mine. All sorrow is due to one’s keeping apart from God. When you are with Him all pain disappears. By sorrow does the Lord dispel sorrow and by adversity does he destroy adversity. When this is done he sends no more suffering, no more adversity. This must be remembered at all times.” Radhanath Swami’s heart was deeply moved by the affectionate exchange between the Mother and her children. A breeze rustled the leaves of the surrounding trees. Looking up, Anandamayi Ma paused from speaking and gazed on a chirping sparrow. With glances and smiles, everyone relished her tender mood. “The world oscillates endlessly between pleasure and pain,” she continued. “There can be no security, no stability here. These are to be found in God alone. Suffering is sent to remind us to turn our thoughts toward God, who will give us solace. Whenever you possibly can, sustain the flow of the sacred Name. To repeat His Name is to be in His presence. If you associate with the Supreme Friend, He will reveal His true Being to you.” Her gentle glance awakened faith and hope, and her simple, unassuming nature brought peace to Radhanath Swami’s heart. Although she considered herself no more than a child, everyone present accepted her as Mother. In the time Radhanath Swami spent with her, He saw renounced sadhus, yogis, and swamis, who typically keep a distance from women, sit at her feet seeking her blessings. Thanks for sharing your experiences in India. You are correct, you are releasing stress. it could be something stuck in your system from long ago and is just now being released. Purification is good. It always comes out better in the end. Imagine you are going through a tunnel (stressful, crying, wanting to get out, etc) and once you emerge into the light, you are relieved and happy. I really enjoy the photos and videos you post. It makes it like I’m right there with you and Daniel and Julia and the gang. All love and blessings from Fairfield, IA. Thank you so much for this, Soren. You are an amazing soul, so wise and generous and kind, and I appreciate you! Thank you for your love and encouragement. I feel your blessings and feel so supported by your presence. All love and blessings to you as well. Jai Guru Dev. I want to comment on the experience of culture shock and sorrow. When I was in Belize recently, it was evident that some of the people I traveled there with did seem affected by culture shock, but I thought I was not. I adjusted quickly and related with the local people easily. I saw so much love… and even in poverty, the people were happy. Then when it was time to go home, I got a meal in the airport and couldn’t finish it… and started sobbing because I couldn’t give my leftovers to the hungry children anymore. For me, the culture shock hit when it was time to return to the “developed” world. My first sight when I got off the plane was an artistic display, 12 foot tall block letters made of flowers that said, “ALL YOU NEED IS LOVE” and that made me cry too. So now that I read your message, it makes me wonder, what did my sorrow mean? What can I use it for? I’ve got to go back to Belize, that’s for sure.